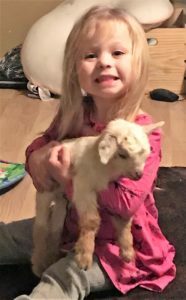 As the family scrambled to save the frail kid, 3-year-old Maebre grabbed a bottle of MFA Shield Plus off the fireplace mantel and said, “What about this?” “I had honestly forgotten we even had the Shield Plus,” Elizabeth said. “Maebre didn’t have a clue what it was, but I thought, ‘Oh my gosh, yes, let’s try it.’” She administered a dose and within about an hour, the kid was up running, bouncing and eating. An employee of Farmers Co-op in Van Buren, Ark., Elizabeth said customers and colleagues have had similar experiences with Shield Plus. She was convinced to take home a bottle when a fellow Co-op employee, Greg Davis, told her how well it worked for his own show hogs. But Shield Plus Technology isn’t a drug, and that’s appealing to producers, Elizabeth said. It’s a nutritional supplement designed to support immune system development, improve feeding behavior and provide quick energy. It’s administered orally in a pump bottle and contains an all-natural blend of essential oils, probiotics, egg antibodies, Omega-3 and Omega-6 fatty acids and vitamins A, D and E. It also has concentrated colostrum extract to help ensure newborns get optimum levels of essential nutrients. 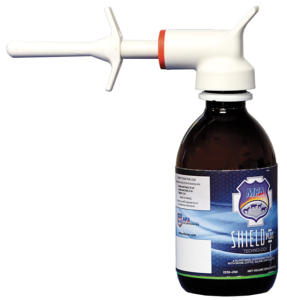 Find out more about Shield Plus all natural feed additive here. This entry was posted on Thursday, March 29th, 2018 at 10:09 pm	and is filed under News & Updates. You can follow any responses to this entry through the RSS 2.0 feed. Both comments and pings are currently closed.